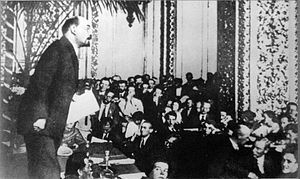 Russian revolutionary Vladimir Lenin addressing the Third Congress of the Communist International in 1921. The complete record of this tumultuous three-week event, finally available in English, enables today’s activists to make the acquaintance of their predecessors in the era of the Russian revolution and witness their efforts to map a new course. To the Masses, Proceedings of the Third Congress of the Communist International, 1921 will be available in a Haymarket Books edition in early 2016.
International Socialist Review is publishing three sets of excerpts from this book, the first of which is reposted below. The Comintern’s crisis stemmed from a marked change of political conditions in Europe. A time of tumultuous workers’ upsurge had ended; the working class, although organized and combative, was in retreat. The wave of revolution, which brought working people to power in Russia in 1917, had spread across Europe the following year, bringing World War I to an abrupt halt. In such decisive countries as Germany and Italy workers seemed able to triumph as in Russia, if only they could unite in effective parties and mass movements. As capitalism struggled to regain a fragile stability, hundreds of thousands of workers rallied to revolutionary parties linked in the Communist International. Yet even as the new International’s massive growth inspired confidence in workers’ approaching victory, by the time of the Third Congress the capitalist class had launched an offensive that threw the workers’ movement into retreat across capitalist Europe. Events in Italy in September 1920 registered this fact. Half a million workers across Italy had occupied their factories and begun to organize production under the leadership of factory councils. The movement spread, bringing the country to the brink of revolution. However, the Socialist Party, affiliated to the Comintern, took a business-as-usual approach, and the movement foundered for lack of leadership. This defeat led to a wave of anti-working-class violence across the country that culminated in the triumph of fascism two years later. The experience of the Italian factory occupations will be discussed in the second of our excerpts from To the Masses. During the months that followed, as the employer attacks gained momentum across much of Europe, two contrasting policies were proposed in the Comintern regarding how to enable workers to regain the initiative. The disagreement concerned strategy, that is, the overall policy needed to guide workers’ struggles toward a decisive victory over the capitalist class. One initiative was to launch a persistent effort to unify the working class in broad struggles for immediate needs — a policy that a few months later was codified as the “united front.” The rival course, later dubbed “theory of the offensive,” was for the Communist parties to seek a favourable opportunity to launch their forces into confrontational action, acting on their own if necessary, in order to galvanize workers into motion. The resulting debate on strategy dominated the Third Comintern Congress in June–July 1921 and is also the topic of our first excerpt. The German Communist Party (KPD), which then embraced an estimated 350,000 members, tried each of these approaches in turn. On January 8, 1921, the KPD published an “Open Letter” addressed to all major German workers’ organization — including those with procapitalist policies — calling for united proletarian action against the employer offensive. The “Open Letter” included calls for a united defense of living standards, armed self-defense against far-right groups, and the freeing of political prisoners. Although rejected by leaders of the major groups to which it was addressed, the KPD appeal won significant support among their rank and file. Nonetheless, many in both the KPD leadership and the ranks felt this policy was over-cautious, and Comintern President Gregory Zinoviev and other leaders of the world organization in Moscow echoed these doubts. On February 22, the German leaders most identified with the open letter approach, including Paul Levi and Clara Zetkin, were repudiated by a vote of the KPD Central Committee. They resigned, and a new leadership took the helm, determined to steer the party toward bolder initiatives in action. The new leaders’ opportunity came three weeks later, when the SDP governor of Prussian Saxony announced police occupation of the region to repress militant workers’ actions. The KPD leadership responded with a general appeal for confrontational action. A week later, the KPD, acting alone, issued a call for a nationwide general strike and unsuccessfully tried to provoke one, looking to spark a revolutionary situation. For example, on March 24, “Communists used every means, including force, to attempt to set off a general strike,” writes historian Pierre Broué. “Groups of activists tried to occupy factories by surprise in order to prevent the entry of the great mass of non-Communist workers, whom they called ‘scabs.’” This initiative, termed the March Action, was a costly failure, causing the party to lose tens of thousands of members. The congress also took time to discuss the world economic situation, trade unions, policies of the Russian Communist Party, youth and women’s movements, cooperatives, anti-imperialist liberation movements, and party organization. International Socialist Review’s third set of excerpts will be from reports by Zetkin, Alexandra Kollontai (Russia), and Lucie Colliard (France) on the Communist Women’s Movement. It produced an analysis of how fluctuations in the capitalist economy can promote anticapitalist consciousness among working people, rejecting reliance on the expectation that capitalism would collapse of its own. In a discussion marked by sharp antagonisms and many missteps, the congress sought, through frank debate and in a spirit of compromise, to promote principled unity of the diverse forces linked to the International. In an era when audio recording was still in its infancy, Comintern stenographers at the Third Congress diligently transcribed everything said in the daily sessions and translated the resulting texts into several languages. Typesetters and printers then did their job, and in about ten days, the printed transcript of each session was in delegates’ hands. Within a few months, a thousand-page edition of the congress in German, the Comintern’s main working language, circulated internationally. It has taken a good deal more time than that to produce a full English-language version. But when the Haymarket edition appears in February 2016, readers will be transported back to the congress floor to witness the debate and meet delegates of many viewpoints. Through this imaginative journey, we will be helping to carry out an essential task of socialists, that of rediscovering and preserving the historical memory of our movement, and helping to make it available for a new generation to weigh and assess. The grandeur and representativity of the congress impressed on the world a constantly more tangible reality of an alternative to the capitalist system. There is no evading . . . a sense of the historic solemnity of this gathering, almost a parliament of humanity. Quoted in John Riddell, ed., To the Masses: Proceedings of the Third Congress of the Communist International, 1921 (Leiden: Brill, 2014), 25. Pierre Broué, The German Revolution, 1917-1923 (Chicago: Haymarket Books, 2006), 501. See David Fernbach, ed., In the Steps of Rosa Luxemburg: Selected Writings of Paul Levi (Chicago: Haymarket Books, 2012). Relevant texts by Levi and Zetkin are also included in To the Masses. For Birchall’s review, see https://johnriddell.wordpress.com/2015/04/13/review-an-essential-resource-on-communisms-early-years/. Luigi Cortesi, Storia del comunismo (Rome: Manifestolibri, 2010), 466. Leon Trotsky, First Five Years of the Communist International vol. 1 (New York: Pathfinder 1972), 297.